One of the newest recruits to team Holy Roar, A.A Williams will mark a change of pace during Holy Roar x Roadburn – but this is no time to sit down with a pint or go browsing the merch. You likely won’t have heard of her when you’re reading this but we are so confident that this is going to turn out to be one of those shows that you look back on and can say “I was there at the beginning.” Think of the rawness of Emma Ruth Rundle crossed with the majesty of PJ Harvey and you may be on the right track… but still a long way from the final destination. Do not snooze on A.A.Williams. 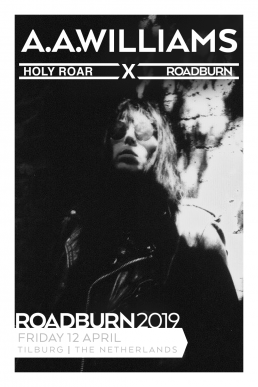 “Being so well known for the unique curation of so many groundbreaking artists, it will be a real honour to perform at Roadburn 2019” – A.A.Williams.